The idea of using ionizing radiation to disinfect water is not new. Ionizing radiations can be produced by various radioactive sources (radioisotopes), by X-ray and particle emissions from accelerators, and by high-energy electrons. The advances in reliable, relatively low-cost devices for producing high-energy electrons are more significant. Unlike X-rays and gamma rays, electrons are rapidly attenuated. The maximum range of a 1-million-volt electron is about 4 m in air and about 5 cm in water. In transit in matter, an electron loses energy through collisions that ionize atoms and molecules along its path. Bacteria and viruses are destroyed by the secondary ionization products produced by the primary traversing electron. The energetic electrons dissociate water into free radicals H+ and OH". These may combine to form active molecules-hydrogen, peroxides, and ozone. These highly active fragments and molecules attack living structures to promote their oxidation, reduction, dissociation, and degradation. Studies have indicated that 400,000 rads would be adequate for sewage disinfection. 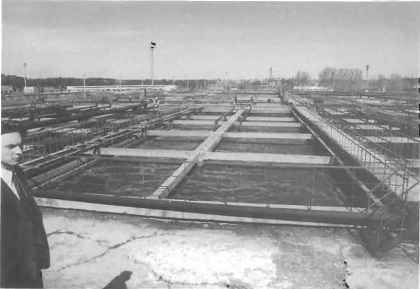 At 100 ergs per gram rad, 400,000 rads would raise the temperature of the water or sludge by 1° C. At this dose, each cm2 of moving sludge would receive about 12 x 1012 electrons, each electron producing some 30,000 secondary ionizations.